When one is used to forks, knives and spoons, it can be difficult to learn to hold chopsticks. But when you have learned how to do it, it will seem very easy. If you have trouble grabbing food with your chopsticks at the beginning, persevere. As with many things in life, practice leads to perfection. Read this article to learn how to handle chopsticks to perfection. 1 Hold the top wand like a pen. Place the first wand in your dominant hand, holding it with the widest side outward and the narrow end inward. Hold the chopsticks about a third from the top. Let the rod rest on your middle finger. The tip of your thumb should hold the wand, holding it in place, and your index finger, they should form a clamp. 2 Rest the second wand on your ring finger. It must point in the same direction as the first stick and the ends must be aligned. Place the wand in the hollow between your thumb and forefinger, it should go to the base of your thumb rather than to the base of your index finger. The rest of your wand rests on the last folded phalanx of your ring finger. Your ring finger must be folded and the first third of the stick must rest on it. 3 Open the chopsticks with your middle finger. Press on the top wand using the phalanx of your middle finger. Your index finger will also move with the wand. Only the fine points of the stick should move. The top of the chopsticks should move closer, but do not touch. 4 Close the chopsticks with your index finger. Press the top wand using the top of your index finger. Your middle finger will also move with the wand and your index finger. When taking a food, place the ends of the chopsticks on each side, centering the food. Close the chopsticks so that the piece is pinched between the two ends of the chopsticks. 1 Separate the chopsticks if necessary. Disposable wooden chopsticks called waribashi, must be removed from their paper packaging and separated. It is common to rub the chopsticks against each other to separate them. You can do this if you are not in good company or at a formal meal, but this practice called kosuri-bashi, is considered taboo and should be avoided. 2 Take the chopsticks with your dominant hand. They must be positioned against each other, horizontally in front of you. Use your dominant hand to lift the chopsticks by holding them in front of you. Take the chopsticks over, the back of your hand toward you. Your thumb and forefinger should be placed about a third from the top. Your little finger must be at the end. 3 Use your other hand to align the chopsticks. Place your non-dominant hand under the chopsticks underneath, with your palm up. Slide your hand to the end of the chopsticks, up to about a third from the end. Your chopsticks should always be horizontal. Keep your thumb above the chopsticks. 4 Slide your fingers. Keep your chopsticks in place with your non-dominant hand while sliding your dominant hand until it is in the correct position. The correct position is the one you learned in the previous step. The bottom wand should be resting in the hollow of your thumb and forefinger, while the other is resting on the end of your folded ring finger. The top wand should be held with the tip of your thumb and the knuckles of your index and middle finger. Position your chopsticks with your left hand so that the tips are close and the ends farther away. 5 Remove your non-dominant hand. Slide your non-dominant hand under the chopsticks. You can now use your chopsticks. 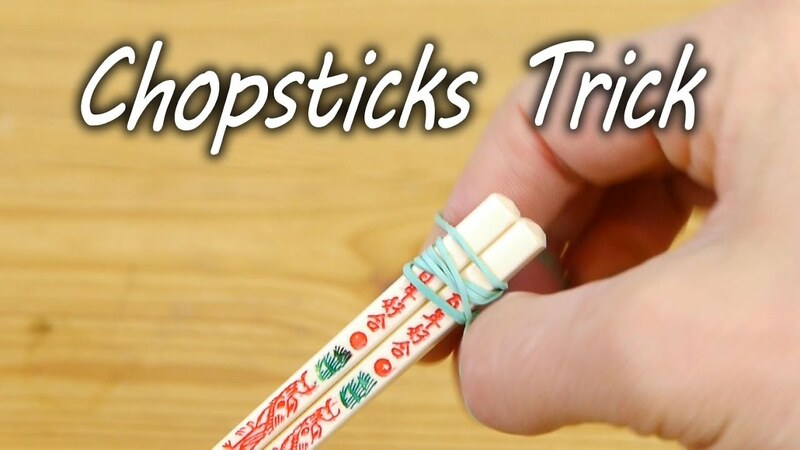 Open and close your chopsticks to pinch pieces of food using the method you learned. 1 Know that there are standard sizes. An important part of chopstick handling is knowing which chopstick size is best for your hand. There is a big difference between chopsticks made for an adult man and for a child. The standard chopsticks served in Japanese restaurants are 23 cm long. This is an adult size however. Most women use chopsticks 21 cm long. Ideally, children should use chopsticks adapted in size according to their age. Children between one and two years old should use chopsticks 13 cm long. At age three, chopsticks should be 14 cm, at four years, 15 cm. And so on as children grow up. At twelve or thirteen, children can use 20 cm sticks. 2 Measure the distance between your thumb and your index finger. Hold your right thumb so that it forms a 90-degree angle with your index finger. Measure the distance between the tip of your thumb and the tip of your index finger. Although there are standard sizes, the best way to have chopsticks at the right size is to measure your hands and determine the length of chopsticks on. 2 Do not scatter your food with your chopsticks. The chopsticks should be used to grasp food. Do not push them like with a fork. This taboo is called sashi-bashi or tsuki-bashi . 3 Do not push your plate or dish with your chopsticks. The dishes should be hand-made, do not push the ends of chopsticks. This taboo is called yose-bashi. 4 Do not transfer food from your chopsticks to another pair of chopsticks. This is done at funerals with a bone from a cremation. Do not do this with food. This taboo is called utsushi-bashi or hiroi-bashi . 5 Put your chopsticks directly in the dish where you want to take a food. Do not move them around when you decide. This taboo is called mayoi-bashi. If you put your chopsticks in a dish, take something with it. Do not take food in the dish is called sora-bashi. Familiarize yourself with the rules of use and taboos related to the handling of chopsticks. This does not matter if you are at a meal with friends or alone, but if you are at a formal meal or with Asian people, it is better to know them.